Hard Knott is better know for its pass and its Roman fort, but the fell that gives both their name is a rather lovely one, with an undulating summit area that repays a leisurely exploration. Hart Knott is a triangular fell, bordered to the west by the River Esk and Lingcove Beck and to the east by Moasdale Beck. To the south there are two Hardknott Gills. One flows west from the top of Hardknott Pass, and is the clear border between Hard Knott and Harter Fell. On the other side of the pass the picture is less clear-cut. The eastward flowing Hardknott Gill rises between Border End and the summit of Hard Knott, and thus can't form the boundary. A more suitable candidate is the nameless tributary of Castlehow Beck that rises just outside the Forestry Commission land on Harter Fell and flows south-east into Castlehow Beck and then into the Duddon. The road over Hardknott Pass thus belongs almost entirely to Hard Knott fell. Most of the fell is interestingly rocky, from the southern flank overlooking Hardknott Pass to the summit area itself, which is made up of a series of rocky outcroppings scattered across a larger plateau. There is a significant dip between Border End and the main summit and several smaller dips scattered across the area. It is well worth visiting Border End, and following the path that runs south-west down a step or two to find a splendid viewpoint for both the Roman Fort and the Eskdale Needle, a rock formation hidden in the western crags. The two main routes onto the fell come from the northern and southern ends. In the south look for a path that leaves the road just east of the top of the pass. This climbs up and curves around to the left until it reaches the top of Hardknott Gill. Eventually the fells on the far side of Eskdale come into sight. At this point turn left for Border End or right for Hard Knott. At the northern end look for a path that heads up the broad grassy slope, leaving the busier path up Lingcove Beck near the waterfalls marked on the OS Map. The upper reaches of this path are very clear, but I must admit I got distracted by the chance to visit the top of Moasdale so didn't follow it all the way to its end. In any case the northern slopes are easy walking. The western slopes are too craggy for the walker. Most of the eastern slopes are fairly simply walking, although lacking paths. Follow the path up Moasdale until the slopes to your west become gentle enough to climb, then head uphill on your preferred route. We have an ascent of Hard Knott from Eskdale. The summit is the highest of a series of rocky outcroppings scattered across the wider top of the fell. The direct approach from the south is protected by a low crag, but the path runs to the left of this barrier allowing easy access to the highest point on the fell. The summit is a great viewpoint for the surrounding fells, and in particular for the line of high fells around the upper reaches of Eskdale (Scafell, Scafell Pike, Esk Pike, Bow Fell and Crinkle Crags), although not for the surrounding valleys, which are best seen from the edges of the plateau. The western borders of Hard Knott are formed by Lingcove Beck at the very top and the River Esk for most of its way. A series of becks run down the western slopes into the Esk, including Great Gill, Bursting Gills and Scar Gill. 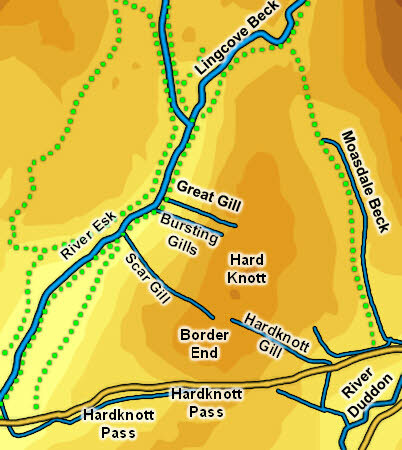 On the southern side part of the boundary is formed by the westward flowing Hardknott Gill. On the eastern side of Hardknott Pass a tributary of Castlehow Beck is a good candidate for the south-eastern boundary. This flows into Castlehow Beck, which then flows into the River Duddon. The eastern boundary of the fell is formed by Moasdale Beck, which flows into the Duddon at Cockley Beck. The Duddon thus forms the south-eastern border of the fell. The second Hardknott Gill rises on the fell itself and flows south east. It then crosses the road and runs south in a steep sided valley, before turning east once again to reach the Duddon. There are several tarns on the summit plateau, all un-named. The largest is towards the northern end of the fell, and feeds Great Gill. On the south-western slopes of the fell is Hardknott Castle, an impressive Roman fort with partially restored external walls and exposed foundations for some of the main buildings. The remains thus more extensive than for many Roman forts, and the location is the most scenic of any Roman fort in Britain. Just to the north-east is the parade ground, a very rare survival.